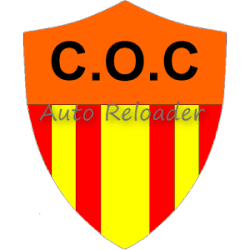 ဒီ App ေလးကေတာ့ CoC ကစားသူေတြ. ကိုယ္က ကစားဖို႔အခ်ိန္မရလို႔ ကိုယ့္ Village ကို လာေရာက္တိုက္ခိုက္ျခင္းမခံရေအာင္ Auto Reload လုပ္ေပးႏိုင္မွာျဖစ္ပါတယ္.. Official CoC အတြက္ ေထာက္ပံ့ေပးထားတာျဖစ္ၿပီး ကိုယ့္ Troops ေတြကို ေလ့က်င့္မႈ မေပးႏိုင္ေသးတဲ့အခါ၊ ကိုယ့္ရြာကို ကာကြယ္ေပးဖို႔အတြက္ ဒီ App ေလးက ေဆာင္ရြက္ေပးထားႏိုင္မွာပါ.. Root ရွိဖို႔မလိုအပ္ပါဘူး..
[ ဒီ App လေးကတော့ CoC ကစားသူတွေ. ကိုယ်က ကစားဖို့အချိန်မရလို့ ကိုယ့် Village ကို လာရောက်တိုက်ခိုက်ခြင်းမခံရအောင် Auto Reload လုပ်ပေးနိုင်မှာဖြစ်ပါတယ်.. Official CoC အတွက် ထောက်ပံ့ပေးထားတာဖြစ်ပြီး ကိုယ့် Troops တွေကို လေ့ကျင့်မှု မပေးနိုင်သေးတဲ့အခါ၊ ကိုယ့်ရွာကို ကာကွယ်ပေးဖို့အတွက် ဒီ App လေးက ဆောင်ရွက်ပေးထားနိုင်မှာပါ.. Root ရှိဖို့မလိုအပ်ပါဘူး.. 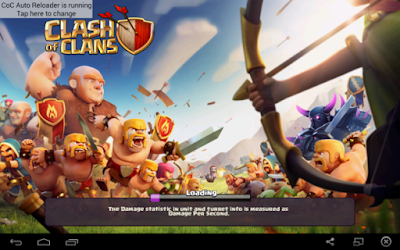 This app is made by some fans of Clash of Clans and we have no connection with the owner of the game.Protect your village by auto reloading Clash of Clans every few minutes, so the game is always active and keep your village away from attackers ! 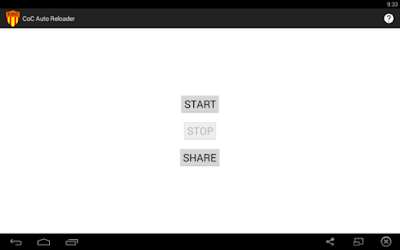 Just one click to start and one click to stop, it’s like opening your COC shield for free without using any gems.Useful when waiting to train your troops or keep your COC village safe through the night. Remember to charge your Android devices if you will be away for a long time!This tool is made for COC lovers, it does not cheat or hack or modify any data of the game. No Need of Buying Shield with Gems. Your village is safe through the night. Doesn’t Hack or Modify any data of the game. Reloads the game Every few minutes. Don’t close your internet connection till you use it. 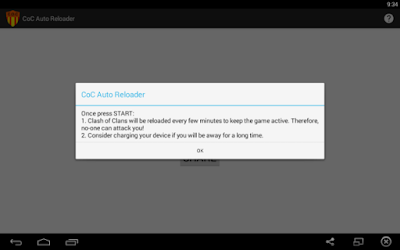 Don’t forget to stop Auto Reloader before playing CoC Again. Before using this tool make sure you connect your village with your account for backup. Don’t forget to charge your Device. Sometimes your game is disconnected by supercell for playing for toll long time.This doesn’t mean your account is banned you can again open the game after 10 minutes. Don’t forget to read this whole post carefully.